Partner Participant： NEXT ACCESSORIES LTD., EBARA THERMAL SYSTEMS（THAILAND） CO., LTD. This project aims to saving energy and reducing CO2 emissions by introducing high efficiency Centrifugal Chillers for an air-conditioning system in the Clothing Tag Factory in Bangladesh. 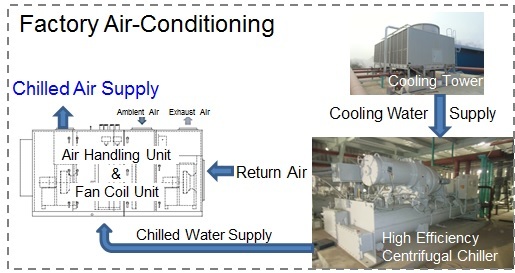 The project chiller applies two-stage compression with economizer and sub-cooler cycle. In addition, high efficient operation is achieved in wide range of cooling load by applying variable suction vanes to an impeller of the turbine. The chillers use high efficiency refrigerant HFC245fa (ODP=0). BD_AM001 Energy Saving by Introduction of High Efficiency Centrifugal Chiller Nippon Koei Co., Ltd.